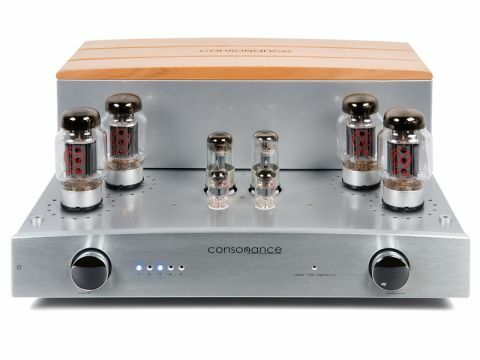 There seem to be quite a few similarly-named amps in the Consonance range and the Cyber-100 Signature is equipped with KT88 output valves appears to be specific to the UK market. It's a classic design, both electronically and mechanically, and a very simple one in terms of its circuit. The valve count is typical: two double-triodes per channel looking after phase-splitting and driving the output valves. In keeping with current trends, there are a couple of 6SN7 valves, an old type that pre-dates the ECC8x varieties so popular in audio. Selection from among the generous five inputs is made by relays and the volume control is motorised and is, therefore, also remote-controllable. Component quality throughout the amp is good, if not outstanding. There are internal bias adjustment points, but these are not intended for use by the owner. Operating mode is fixed. The look of this amp is considerably enhanced by the profiled wooden slats which cover the transformer enclosure. By contrast, the valves are covered by a rather unprepossessing cover, easily removable and has an unusually high propensity to ring when struck. By the same token, it can 'sing-along' in harmony with the music and, although we prefer valve cages to be fitted from a safety point of view, we can see the attraction of going without, if the amp is sited safely out of the way. Although our listeners quite liked this amp, and indeed found praise for almost every specific area of performance, they didn't quite seem to have been fired up to paeans of enthusiasm over it. Perhaps one comment from their notes sums up what seems to be the problem: 'The sound lacks natural beauty'. Everything is there: apparently - bass; mid and treble; detail; imaging; timing – but it just doesn't quite add up to beautiful music. Well, saying everything is there is a little vague and needs some clarification. Bass is one of the Cyber 100's best points, present when needed with plenty of attack and precision, but never overwhelming or exaggerated. Midrange is not obviously coloured, but lacks some insight and, at times, can seem to emphasise certain instruments a little at the expense of others. We never really established a clear pattern here; the emphasis benefitting higher-pitched instruments on one recording, lower ones on the next. Treble isn't entirely clean and rather like the midrange, alternates between slight sibilance and a rather dull quality. Such paradoxical results are often the result of a lack of purity in the sound. Distortion, in the most general sense, can have the oddest effects subjectively and we strongly suspect that that's the case here. Despite this, it is perfectly possible to enjoy this amp and we found it relaxing and inviting. We just would have liked a little more revelation – it's all a little safe and lacking in surprise.